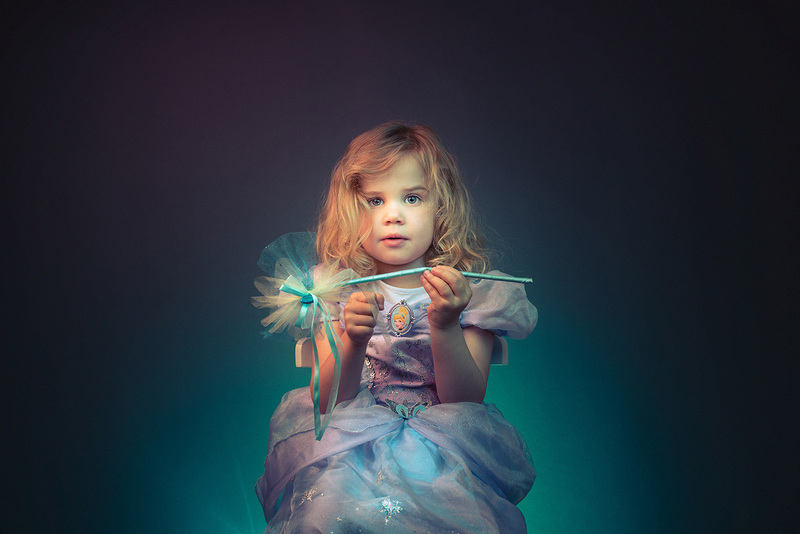 Creative Studio photography using coloured gels and soft lighting to create a magical dreamy portrait of a young girl dressed as a princess. The portrait was captured using a studio setup in Newbury Berkshire. I’ve always wanted to experiment a little more with the use of coloured gels. Ofcourse so much can now be achieved with the increasing sophistication of colour correction tools from programs like Photoshop & Lightroom but it can often be quicker and more rewarding to capture everything in camera. However, you need to make sure you use the right coloured gels because unlike software there’s no simple undo / redo buttons available once the photographs are captured. Ofcourse when photographing children in the studio you need to act fast so there’s little time to worry about focusing, exposure, lighting etc (all of that should be done before the shoot starts). It can be completely unpredictable knowing when you’re going to capture a good shot because facial expressions, body position and mood can change dramatically from one moment to the next with children. Having pre-set the lighting, background colour and brightness I photographed the portraits using a high fstop which mean’t I didn’t need to worry too much about focusing compared to shooting outdoor portraits with very narrow depths of field. Below is just one of the shots I captured. However, the best were probably the first portraits of the talent dressed up as a dragon and roaring into the camera. I’m certainly going to mix some gels into more of my work simply because they’re great for creating some different and potentially more modern / creative styles of shooting portraits.